What's the Locrian Bebop Scale? The Locrian bebop scale is made up of eight notes, it's an octatonic scale. The formula is 1 - b2 - b3 - 4 - b5 - 5 - b6 - b7. This is the Locrian mode with a passing tone (5) between the flat five (b5) and the minor sixth (b6). This scale is commonly played over m7b5 chords but it can be a good choice when you want to improvise over dominant chords as explained below. The dominant bebop scale contains the same notes as the Locrian bebop scale. It means that you can play the Locrian bebop scale starting on the third of a dominant 7 chord. For example, over G7 play B Locrian bebop. How to Play the Locrian Bebop Scale on Guitar? 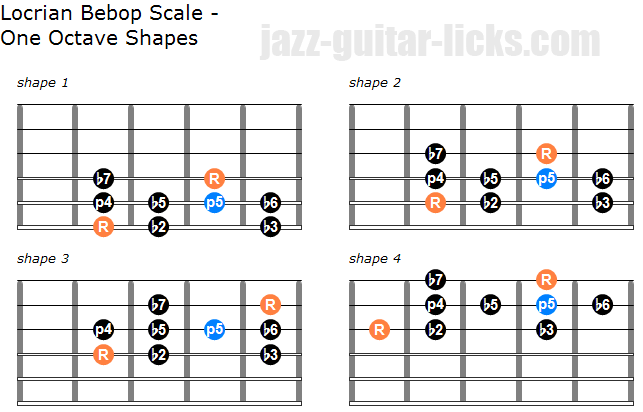 Here are four shapes to play the Locrian bebop scale on guitar. In a first step, for better hearing this scale, it is recommended to play these diagrams starting from the lowest root (R). Then you can try to practice them starting from the chord tones, (the most important notes). The chord tones are 1 - b3 - b5 and b7. You need to make sure to play the passing tone (5) on upbeats and the chord tones on downbeats. Another important thing to take into account is to practice these patterns in twelve keys and associate them with the corresponding chord. In these diagrams the Locrian bebop scale is represented within the space of two octaves. Here is an example of how to use the Locrian bebop scale in a minor II-V-I sequence. The D Locrian bebop scale is played over a Dm7b5 chord. Hello. I was looking for info on "Bebop Locrian" and found your version among a few others on the web. When it comes to 'Bebop' scales people tend to invent all kinds of 8-note scales. In classic Bebop there were probably 2 scales in common use: The 7th Bebop with the passing n 7 and the Major Bebop with the passing #5. The Dorian Bebop is just an extension of the 7th with the passing note falling on n 3. You suggest n 5 as a passing note for 'Bebop Locrian'. I think if you consider the scale in the context of min ii-V-i it would be logical to view it as an extention of E7 being the dominant of A-min. In that case it would insert n 3 into the Bebop Locrian by analogy with the Dorian minor. However that's probably a matter of taste after all. Many don't understand why in the descending Bebop Dorian the n 4 is allowed to fall on the strong beat. Why not if that's a valid color tone over minor ii. In min7b5 however it will probably rub against the b5 while your passing n 5 will smoothly place that 4 on the off beat. That could be a good thing but do you know if that was a comon practice in the Bebop soloing?